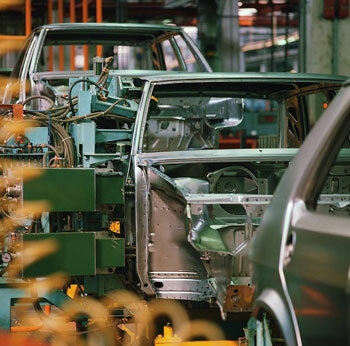 Throughout much of its history, Ford was a vertically integrated company, owning its own supply chain assets all the way back to raw materials facilities such as steel mills and rubber plantations. And although they have transitioned to a highly-tiered virtual enterprise model, Ford has sought to "have their cake and eat it too," maintaining or regaining some of the benefits of their original vertically integrated model. One aspect of this (Ford's use of supplier parks) is described in "Supplier Parks - Back to the Future." In the article below, we examine another aspect of Ford's attempt to get vertical integration benefits from a multi-tier supply chain - specifically, how they buy steel on behalf of their entire supply chain. Earlier in this series, we explored some specific examples of supply chain orchestration in practice. 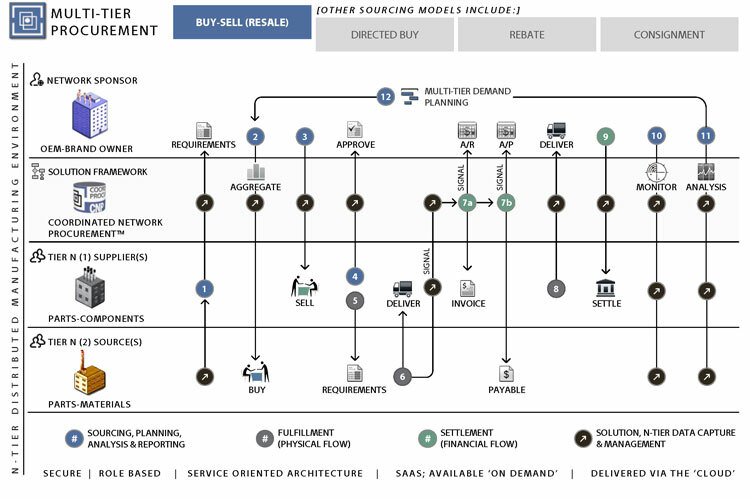 In Part One we introduced the concept of the supply chain orchestrator. In Part Two we discussed one type of orchestration, buying materials or components on behalf of suppliers in your supply chain. In this article, we explore how that concept (multi-tier buying) is implemented in actual practice by Ford. Major OEMs have historically enjoyed the upper hand in their relationship with steel producers (mills) and were able to keep prices suppressed due to the market structure in the steel industry in which OEMs bought massive amounts of steel. Over the past two decades, a number of market factors (e.g. rapid growth in China and other emerging economies, consolidation of steel producers, fragmentation of auto steel spend, supply constraints) have caused the balance of power to level off considerably, and even favor the mills (steel prices tripled this past decade). Using and analyzing data from this program as inputs into forecasting commodity spend, and shaping commodity management strategies. When Ford buys steel on behalf of their suppliers, two simultaneous transactions take place: the ‘buy’ with the steel source, and the ‘sell’ to the parts supplier, passing title from the steel producer to Ford to the supplier almost instantaneously. The physical flow of material is unchanged; there is no cash-flow impact for Ford, and they do not need to own, store, or manage that inventory. These transactions became a sort of adjunct business and a profit center for Ford procurement as they determined the needs, aggregated buys, and resold the steel at an agreed-to price. By 2000, more than $1B of steel was flowing through these arrangements. This was still only about 20% of Ford’s overall steel spend. The manual effort required to manage this business process prevented them from scaling this program to the remaining 80%. The process comprised over 170 different business activities via manual, paper-intensive workflows. Ford’s procurement organization was set up to buy steel. They were not equipped to sell steel. Furthermore, their ERP systems and business architectures were not designed to accommodate the same entity as both a supplier (e.g. a stamper) and a customer. The process was fraught with the risk of trying to manage both receivables and payables for the same entity within their ERP environment. To accomplish this, Ford was forced to add significant head count over the years to manually debit, credit, cross-check, and enter transactions into ERP. In 2000 Ford saw the opportunity to leverage the emergence of web-based technologies and sponsor an automated internet-based procurement system designed to manage a ‘networked buy/sell’ business process for their entire community of stampers and steel processors. Originally called e-Steel, the platform is now called Newview’s Supply Network Platform.™ This technology allowed Ford to scale their program to cover the other 80% of their aggregate steel spend across their global supply chain. Supply Assurance: Topping the list of program benefits for Ford has been a greater continuity of supply in times of allocation. Operational Efficiencies: Over the years since automating their program, Ford has been able to further optimize their spend by aligning mill production capabilities and efficiencies with part suppliers’ operational capability. This has enabled throughput gains and better optimization of transportation, which can be a significant cost due to the substantial weight of steel. Reduction in Credit Risk Costs: Ford’s supply base of service centers/processors and part suppliers is highly fragmented, with some smaller “Mom and Pop” operations in the $20M - $100M size. The financial health of Ford’s supply base varies, but in general presents a higher credit risk than a major OEM. This credit risk was another factor (besides small volumes) that drove prices higher when steel was bought individually by these suppliers. When Ford consolidated their steel purchasing, the mills benefited, because they could reduce their overall credit exposure and sell at a lower price to Ford, reflecting that transfer of risk. Exposing Process Inefficiencies and Costs: Unbundling the procurement of raw materials from the stamping service provided by their suppliers has the effect of removing the suppliers’ buying power/negotiating skill from the equation. This effectively isolates exactly how efficient each supplier is at the value-add processing steps it is providing. It exposed the weaknesses of suppliers who may have been good buyers relative to competitors, but were not efficient value adders. This leveled the playing field based on processing effectiveness, enabling Ford to know which specific suppliers were underperforming, and work with them to improve the supplier’s performance and/or intelligently rationalize Ford’s supply base. Analytics and Visibility Benefits: The multi-tier system has provided Ford with increased visibility into material, information, and financial flows across their supply chain. They can mine this data to make better decisions such as optimized tax and foreign exchange decisions. In addition, it has helped improve overall forecasting, planning and coordination throughout the Supply Network. For example, they have fewer financial and material claims disputes with suppliers, and have reduced the time required to resolve any disputes that do arise. In the next installment of our series on Supply Chain Orchestration, we will look at how Ford was able to use their multi-tier platform to rationalize the specifications for the steel that is bought across their supply chain, and how that helps them to consolidate spend, make better use of inventory, and provide more flexibility. For more on the role of the Supply Chain Orchestrator see the Orchestrator Collection. 1 Steel costs can represent 60% or more of the cost of some finished parts, though a much lower percentage of the finished vehicle cost.